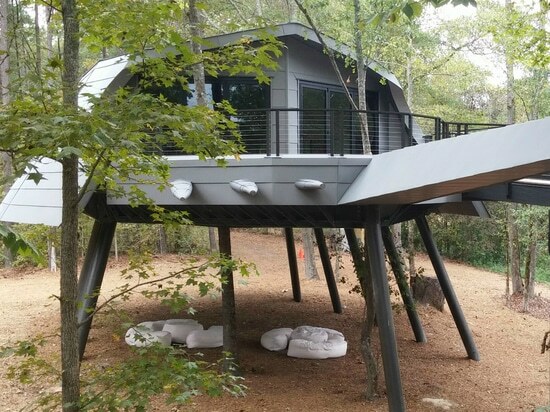 Grammy-award-winning artist Zac Brown dreamed of building a treehouse for campers at his Camp Southern Ground in Fayetteville, Georgia. The camp's mission is to serve children of all abilities with a special emphasis on those with neurodevelopmental disorders as well as social or emotional challenges. Since Zac wanted the treehouse to have a building life of 100+ years, elZinc Natural was used. 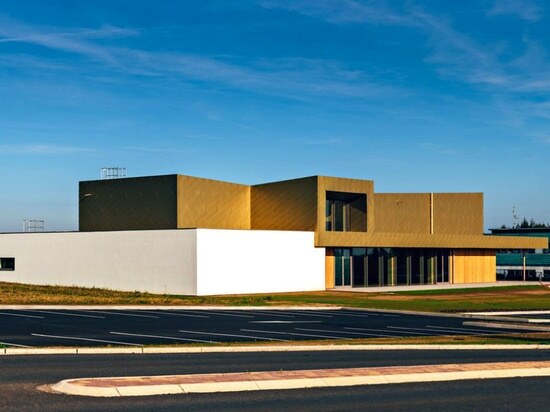 Zinc was also selected as exterior sheathing due to its corrosion-resistance and 100% recyclability. 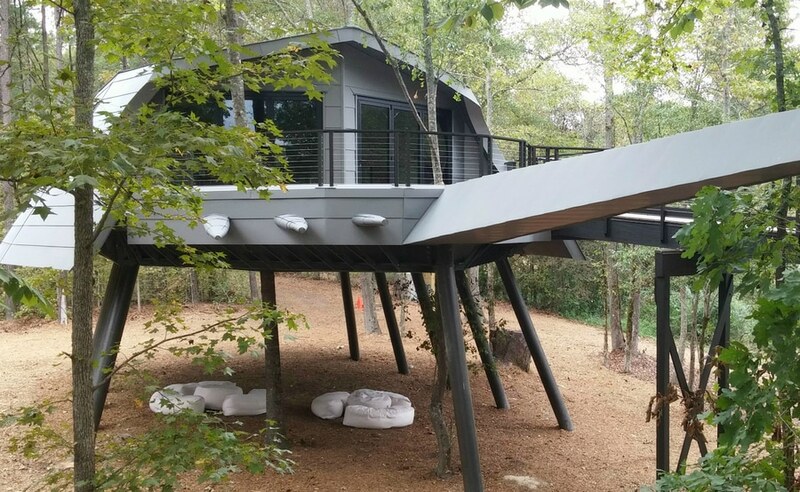 When sheathed in zinc metal sheeting, the treehouse looks like a futuristic crustacean, hence its name “Space Crab”. This massive Space Crab can hold up to 150 people and carry over 187,000 pounds! 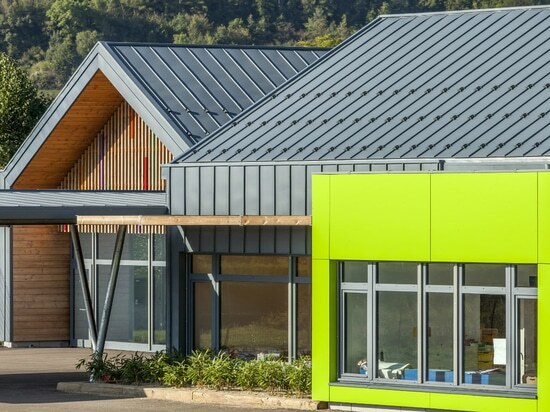 The elZinc sheets were installed in a horizontally disposed flat-lock system which provides relatively subtle joints. The end to end joints are made to coincide with the inclined corners of the crab ‘shell’, keeping the cladding clean and neat. Careful coordination of the flat lock joints with the top level of the windows also contributes to a sensation of visual simplicity which lets the observer focus on the core aspects of the design. The malleability of the elZinc sheets has been put to good use along the curved wall capping which ‘embraces’ the visitor at the entrance, and this combined with intelligent detailing and setting out of the sheets around the terrace doors rounds off a singular project which elZinc is proud to be a part of. 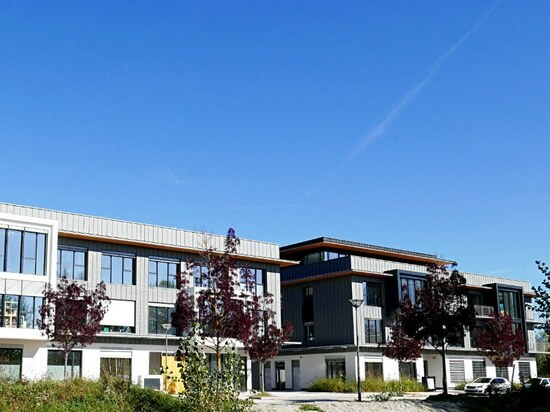 This tertiary building, designed to house the medical and paramedical facilities of Technolac was made using a combination of the Zinc Graphite and the Zinc Slate, allowing a perfect integration with both the existing buildings and the environment. 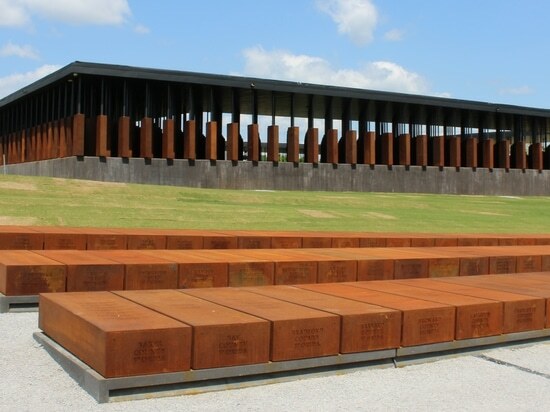 This striking monument, designed in partnership with MASS Design Group, keeps alive the memory of the terrible events that were witnessed in the United States during the era of slavery and social segregation and the subsequent racial violence. HOW CAN A MEMORIAL HEAL THE WOUNDS OF THE PAST? HOW CAN A MEMORIAL HEAL THE WOUNDS OF THE PAST?